I kinda wish babies came with manuals or some kind of guide but they don’t and for every new, first time parent it’s a huge learning curve. You’ve probably read the books and searched the Internet for everything you need to know, I know I have!! In my short time as a first time mum I feel like I’ve learnt a lot!! So I thought I’d share some of my first time essentials and things to do! This advice is handed out every where and is sometimes easier said than done but it will help if you do it at least half the time. A one handed snack for during feeding is a must. Feeding especially breastfeeding is hard work and particularly for the latter you need the extra energy. And even if you are bottle feeding you deserve a treat too. I’ve found this really handy for night feeds so I stay awake, particularly when Henry doesn’t want to settle straight away and I need to rock him. We’re currently on Brooklyn 99, Mythbusters and Orange is the New Black. We have a baby essentials box in the living room and bedroom, and a drawer in the nursery. Inside the living room box is nappies, bags, wipes, cotton wool, muslin squares, bibs, nappy cream, breast pads, antibacterial soap, and Lanolin cream. Upstairs we have the same split between the nursery and our bedroom. It just makes life easier if you have everything close by. We use the ‘baby tracker’ which has proven invaluable when it comes to feeding and recording nappies, especially as the midwives and health visitors always ask about both. It’s so simple to use, and is perfect for all mums no matter how you are feeding. Some of the best times I had in the first few weeks was when I went out for a walk with the pushchair. Fresh air, exercise and a generally calm or asleep baby made for one happy mumma. Henry loves to be cuddled. Loves sleeping in peoples arms or up.close to their chest. Which of course makes it a little tricky to do anything. We found our baby carrier to be a life saver on nights when he didn’t want to settle. Unfortunately it’s a little difficult to put on on your own, though it is incredibly comfy when on. For when I’m on my own I have a wrap around sling which is so simple to use and so effective. I followed this video on how to use my wrap. So that’s my list of essentials. And remember it does get easier and the best things in life aren’t always easy. 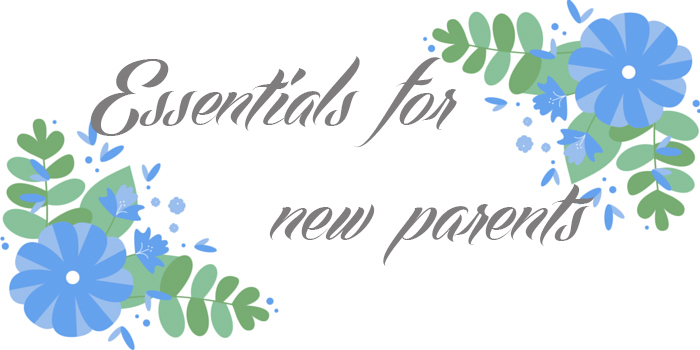 Share your essentials for parenting in the comments below! "Changing bags for little ones"
Great advice! yes the sleep when the baby sleeps is the number one tip but I struggled because there was always something to do, housework, chatting with a friend…or taking a shower!! !